The Casio Baby-G Ana-Digital Watch features cool and refreshing functions that are suited to surfing and other active pursuits. The large multi-faceted stainless steel bezels create a look that’s casual, yet elegant. The multidimensional design of the face resembles the surface of waves glistening on beach sand. 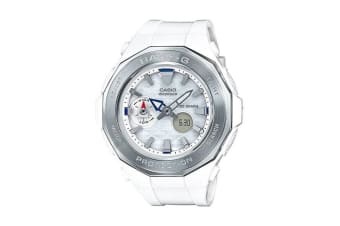 The Casio Baby-G Ana-Digital Watch features a Tide Graph function at 9 o’clock and 200-metre water resistance to support a wide range of activities.